Syrian Family Hui at Moira GallagherSyrian Family Hui at Moira GallagherMoira Gallagher connects with its Syrian Community hosting a successful hui. We have been listening to your feedback about our new look Kōrero and have made some changes we hope you will find helpful. Larger news items can be accessed on the left under Latest News while smaller items are below. You will notice some new tabs at the bottom of this page. Click through to those items. We would love to hear what you think of these changes, please email Jan with your thoughts at jan.hannon@wmkindergartens.org.nz. Just a reminder that the final day for receiving any PA1’s for building and environment work to be completed over the October term break is Friday 15 September 2017 at 5pm. Just a quick note to inform you that Infocare is upgrading to version 2.92 on Saturday 2nd September so there may be limited access on the weekend. Tomorrow is the financial month end and we will be working on our August Board and Kindergarten reporting in the coming weeks. To help us with this we would be grateful if you could have your Infocare records for the last week of the month (being this week ending Friday 1 September) completed by the end of the day on Monday 4 September. Please let Tania or Hannah know ASAP if you expect there to be any delay with completing these tasks by the date indicated. Board voting papers for Community Representatives will be distributed to all Kindergartens from Tuesday next week. Would you please make sure these are given to all families. We will also provide you with a box for completed voting papers to be put in. Please check the box each day and scan through the papers received to agm@wmkindergartens.org.nz. Families may also return the forms either by post, PO Box 50-743, Porirua 5240, scanned and emailed to agm@wmkindergartens.org.nz or by dropping into the Association Office. All votes must be received in the Association office by Friday 15th September 2017. Any members attending the AGM on Tuesday 19th September 2017 are able to vote at that meeting. Staff voting papers to elect the Staff Representative to the Board will be sent shortly. It is great to see the Kindergartens continuing to promote the upcoming general election with their Kindergarten communities. 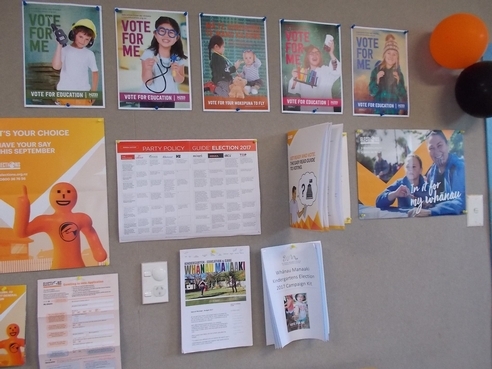 There are still around 250,000 young people yet to enrol for voting. You can do your bit to reduce this number by encouraging all of the young people in your life to register and then take them with you to vote on the 23rd September. The Green Party has today announced its education policy and you can read that policy here. So Long, Farewell ..... for 6 Months Anyway! Tomorrow is my last day at Whanau Manaaki as I take up my secondment with ERO on Monday. While I am looking forward to this opportunity I will miss you all and look forward to seeing you again in March 2018. Don't forget to check out the stories listed down the side menu.